THE JET BRIDGE, that strange, too-often troublesome umbilicus connecting terminal to fuselage. The other day I was stuck on a regional jet at Kennedy airport for twenty minutes because the gate agent couldn’t get the damn thing into the right position. If only I had a dollar for every time this has happened. Part of the problem, I think, is that these devices are so monstrously over-engineered. Take a look at the typical jet bridge. The things are enormous. They must weigh hundreds of thousands of pounds and cost millions of dollars. That wayward bridge at JFK was twice the size of the plane. As the agent fumbled with the thing, it looked like she was trying to steer a battleship. Hydraulic arms flexed and groaned, machinery wailed, lights flashed and bells rang. Finally the tires began to turn — like the wheels of those huge mobile barges that NASA used to position the Apollo moon rockets. All of this so that fifty people could walk the negligible distance from the aircraft to the terminal. I realize the bridges are multifunction. The air conditioning and power connections used by the plane during its downtime are part of the assembly. But do they need to be so big and heavy, with all of this Rube Goldberg machinery? It’s just a gangway for crying out loud. You see simpler, lightweight jet bridges in Europe and elsewhere around the world — with windows! — but here in the U.S. we rely on these ponderous, lumbering contraptions. Of course, I’m opposed to jet bridges on principle. I prefer the classic, drive-up airstairs. Some of the international stations I fly to still employ those old-timey stairs, and I always get a thrill from them. There’s something dramatic about stepping onto a plane that way: the ground-level approach along the tarmac followed by the slow ascent. The effect is like the opening credits of a film — a brief, formal introduction to the journey. The jet bridge makes the airplane almost irrelevant; you’re merely in transit from one annoying interior space (terminal) to another (cabin). But if we’re going to rely on jet bridges, we ought to have not only simpler ones, but more of them. It never ceases to amaze me, traveling in other parts of the world, how much quicker and smoother the boarding process seems to go. In Asia, for instance, I’ve seen them board 500 passengers onto an A380 in well under thirty minutes. How do they do it? Here at home, it takes 45 minutes to get 70 people onto a damn regional jet, and it’s chaos the entire time. One of the reasons for this is that airports outside the U.S. will often board and deplane a widebody jet through multiple doors using multiple boarding bridges — at least two, and sometimes even three. This makes a massive difference in how long it takes to move hundreds of people, and their hundreds of bags, between the terminal and the cabin. Dual-bridge boarding does exist in the United States, but it’s uncommon. In Amsterdam, KLM boards its 747s and 777s using forward bridges, plus a unique, over-the-wing bridge that connects to the rear fuselage. These overwing bridges are by no means lightweight, relying on a superstructure that looks like something you’d see in a shipyard where they build aircraft carriers, but they do make getting on and off the jet a quicker and more pleasant experience. My friend Harriet Baskas recently penned this interesting story for USA Today on the history of the jet bridge. An Emirates A380 takes on passengers in Dubai. Author’s photo. Overwing jet bridge at Schiphol Airport, Amsterdam. Author’s photo. Another reason that boarding is more efficient in other countries, Asia especially, is that carriers there tend to use bigger planes. In Asia, even a 45-minute hop is often aboard a widebody 777 or A330. Widebody planes, with multiple aisles and all-around greater spaciousness, are by their nature easier to get on and off. In the U.S., aircraft size has been steadily shrinking over the past two decades. More people are flying than ever before, it’s true, but we’re doing it on smaller planes: regional jets, A319s, 737s and the like. The reasons for this are a subject for another time, but the narrow aisles and limited bin space on these planes mean longer boarding and deplaning times. Passengers almost always board and deplane through doors on the left side of the cabin. The main reason is logistical: the left side is for passengers, while the right side is for cargo and baggage loading. Jetliners have their cargo doors on the right side. This reduces clutter and congestion on the apron. Look around at any airport, and you’d swear that 90 percent of the world’s jet bridges are emblazoned with logo of HSBC. How did this company come to display its colors on virtually every jetway on earth? By spending a lot of money, is how. I’m not sure this advertising strategy has been all that effective, however, because although millions of people see these four letters every day, relatively few of them know what they’re looking at. I did a little impromptu research, asking several colleagues if they knew what HSBC was. Not one of them could tell me. HSBC is a British bank, originally founded in Shanghai and Hong Kong. The letters stand for “Hong Kong and Shanghai Banking Corporation.” It’s currently the biggest bank in the world measured by assets. The company pays tens of millions of dollars every years to airport authorities the world over — mostly at major international hubs — for the rights to put its name on boarding bridges. In 2012, HSBC was hit with a $1.9 billion fine for laundering money on behalf of drug cartels and terrorist groups — carrying on a tradition of questionable practices that goes back generations, apparently, to the days of the opium trade and, later, the Vietnam War. Air India 777 at Kennedy Airport. Author’s photo. One of the more surreal experiences I had deplaning recently was in Cochabamba. I ended up near the front of the plane, and was one of the first people off. We walked down the stairs into the open air and … were somewhat abandoned. Eventually more people got off and I could follow them to the terminal, but it was a very strange feeling just being left to wander around on the tarmac. If I hadn’t known that HSBC was a bank, I would have thought they were the company that made jetbridges. I’m a fan of airstairs too. Maybe not so practical for big jets or foul weather, but the occasional flight I board via the stairs is a nice treat. Thanks for the nice blog. I appreciate your work. The JRC 5019C BWB is a design that is the C47/DC3 of the 21st century; the aircraft be the flagship of the NIFS and Global airports. Americans are slow assed, lollygagging, dilly dalliers in the WORST possible way when boarding and deplaning…bar NONE. Just look to see how many Americans actually walk on escalators as an indicator. Additionally, what passes for “carry on” luggage in steerage class is simply outrageous and ought to be banned in most cases. But no one checks anymore and they force the flight attendants to deal with it all. In Asia, passengers primarily want to get the hell on the plane and sit, then get the hell OFF the plane after it lands. Americans seem to think it’s a big social event with chit chatting and making new friends while standing in the aisle for 20 minutes. Whether Japan Rail does it these days I don’t know. But in the ’70s I often traveled on the Bullet Trains. In typical Japanese efficiency, my ticket would read something like. 3. 6. 28. Track 3, car 6, seat 28. We stood on the platform where a large arrow would align with the car number. Sure enough, the train came to a stop with the REAR door of the car aligned with the arrow. Passengers would disembark through the front of their car, while new passengers boarded through the rear door. This avoided people trying to get on while passengers were trying to get off through the same door. The Bullet Trains stayed in the stations for only a few moments. Often less than a minute in the smaller stations. For years here in the U.S. both front and rear doors were used on aircraft. First Class and some of the forward Coach rows boarded through the forward door, and the balance of Coach through the rear. And it worked! 727s had a rear stair that lowered from the tail of the plane in line with the aisle. Then in 1974 a 727 was hijacked by the infamous D.B. Cooper. He disembarked the aircraft at altitude by lowering the rear stair and biding adieu. Ransom money in hand, parachute on his back. After that, the rear stairs were closed permanently. In my mind, the absolutely worst boarding ramps are at JFK – Terminal 4 where you have a very long, multi-level ramp that eventually leads to a standard Jetway. There are some of the nice glass jet bridges at the new Wichita, KS airport terminal. Possibly the only ones in the US? I like airplanes and still get a thrill from flying, although the industry is working hard to make it a humdrum affair. The air bridge was in use in the U.S. long before the rest of the world employed them. I prefer the jet bridges because I hate climbing the stairs outside. This guy should walk outside more often in the rain, or have bad knees and hips, perhaps he wouldn’t complain about the jet bridges so much. Upon landing in Seattle, Alaska Airlines unloads their jet on both ends to speed things up. I took the back way becasue I like walking to tarmac level and outside. I also like flying the occasional regional prop plane, most recently around Seattle that land (or dive bomb) at Boeing Field; get out and walk 200 feet around other aircraft (kick some tires) to the terminal. I miss flying regional prop Bombardiers, I like the fan noise and outdoor boarding. These planes use way less fuel but are on the way out. Watching a regional crop duster queuing up behind a 777 for take off at a major airport is a thing of the past I suppose. I tend to fly a lot, usually with expensive and delicate carry on items (camera, lenses and so forth)… Asia does have remarkable boarding times compared with other places, but I think I comes from two reasons: one is culture – The passengers tend to board a bit more organized (not blocking the aisle while taking out their earphones from the overhead bag). The other one is that US airlines have become frightenly rigid. The flight attendants are more concerned about each passenger obeying the rules (like guarding the emergency rows seats), that they simply don’t help speed up boarding (finding room of overhead bags is key). Snort. On my last trip in January, I used airstairs in Tahiti (slippery with rain), Easter Island (slippery with rain) and Antarctica (slippery with ice). I can do without the romance of airstairs. THANK YOU, Patrick, for pointing out the HSBC/airbridge thing! I’d never registered it, but now you point it out, of course it’s incredibly familiar. The HSBC advertising was developed to support their slogan ‘The World’s Local Bank’ which came about because they operate in an insane number of countries. From memory, their adverts tend to be concentrated at hub airports connecting to international routes and are very much aimed at business travellers. The really odd bit about those adverts is that I’m sure they make jet lag all the weirder. You board a plane through a metal tube covered with HSBC adverts, and several hours later you get off through an identical metal tube walking past exactly the same adverts only to find yourself in a totally different climate and at completely the wrong time of day. Patrick would find the stairs far, far less fun if he were behind me on them. I can keep up with the group on a bridge, but moving my bulk manually up against gravity is time consuming and I am very careful going down (when this much mass falls, it really falls). As to why our bridges are so cumbersome and unwieldy, my guess is they are cheaper than the nicer ones. The airport, I presume, buys these things when they equip the place, not the specific airline using the gate. The airline using the gate may even change from year to year. The airport cares more about keeping building costs down than quick loading and the airlines aren’t likely to pay more for gates equipped with nicer, faster bridges. This is a complete guess, backed up without a single fact or knowledge of airports, so give it the little weight it deserves, but I would love to hear what Patrick thinks. One thing quite weird… I don’t remember ever seeing a HSBC sign in Hong Kong airport, the “H” in HSBC. No idea why. You’re right, or at least you certainly were up to the time I last flew through Hong Kong, which was a while back. Almost every jet bridge in Asia has an HSBC logo, except in Hong Kong, where it’s the dominant consumer bank and one of the biggest investment banks. Maybe they just think it’s not worth it because there is no-one in Hong Kong who isn’t familiar with HSBC. I miss walking up to the plane outside and climbing the stairs, smelling the jet fuel, watching the action. I haven’t been to Capetown in a while but you used to walk up to the 747’s boarding outside, and the terminal and lounges were on ground level with large windows so you were right by the planes. I’ve noticed the restrictions of hand luggage on European carriers significantly speeds up the boarding process. Recently at Mineta/San Jose Southwest deplaned passengers using the jet bridge in front and air stairs in rear. Only have deplaned from large jet on air stairs in US twice before: San Diego in 1979 and Westchester in the 1990’s. Jet bridge every time. One problem with stairs is that you often have to ride a crowded bus, frequently standing, to get to them. Then there is weather. Last time I encountered stairs, in Asia (probably Japan), in the rain, there were airline employees standing by with umbrellas, but I doubt you’d see that in an American airport. But the disability issue is the main one. I needed a wheelchair for my last flights and was very glad of the jet bridge. There was one time in the 90s in Turkey when I also needed a wheelchair, and was delivered to the plane on an open hydraulic platform I think used for catering supplies. Fun once, but not long term. 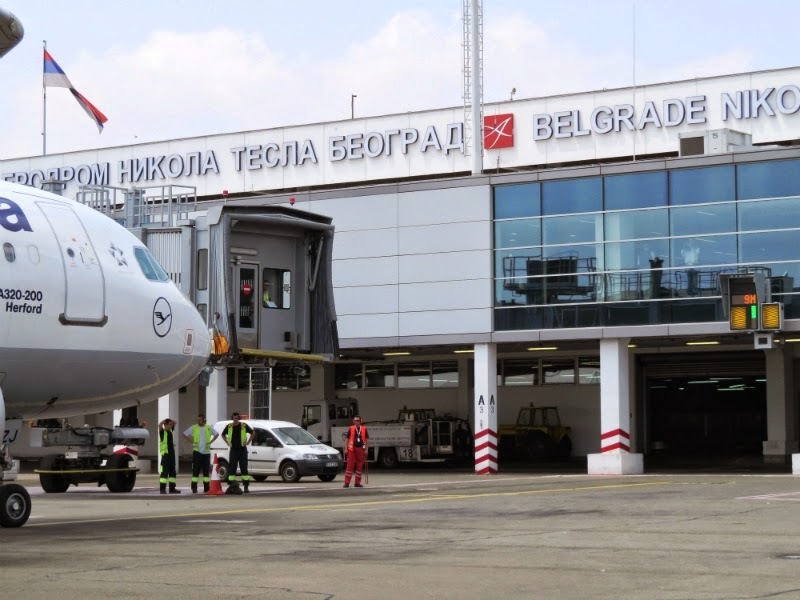 At Belgrade airport in Serbia (BEG) all bridges are made almost completely out of glass (http://www.aviokarta.net/backend/uploads/news/big/beg_most.jpg). It is almost the best of both worlds, convenience plus amazing views of the runways, aircraft and all the activities going around. And the terminal building has floor to ceiling windows throughout (http://4.bp.blogspot.com/-vH7Phy8BjX4/U6-zTMLBWWI/AAAAAAAANFQ/9w1w9jOByMM/s1600/vdgs+2.jpg) for great views. The airstairs may be romantic and nostalgic, but seriously, do you want to walk outside to a plane in Minneapolis in January? I miss the days of boarding by stairs, although I get that nostalgia fix every time I fly to Kona. Who can forget walking up to that beautiful blue and white Pan Am 707 in New Delhi or going up the tail stairs of a BOAC VC10 in Nairobi. That being said, I thought boarding via the mobile transporters at Dulles in the 60s was something straight out of 2001! The VC10 brings back treasured memories. There looks and performance were perfectly matched. But they were very thirsty on fuel. Bigger and heavier than a B708. An unrelated question about airline routes. Qatar airlines has just announced that they will be having flights from Canberra starting next February using the 777-300. However when the details were released it turns out that the flight is going via Sydney which is only about a 45 minute flight from Canberra. Why would an airline launch a route with a 2 stops so close together? I also got the chance to board a Southwest 737 through the back door in Albany, NY as they have a couple of those over-wing bridges. Another thing of note is that many regional aircraft have their front landing gear so low that they have steps built into the front door. I know the Bombardier CRJ and Dash Turboprop have steps built into the front door. Another difference at most foreign airports is that gates aren’t usually tied to a single carrier and airports try to keep them busy all the time to maximize throughput. The result is that they are motivated to get people on the plane quick so the gate can be freed for the next flight. At US airports a gate may sit empty for hours until the next flight for the dedicated airline arrives. Remote stands are also more common at foreign airports, especially busy ones like Frankfurt. These have the advantage of airstairs (yea!) and the disadvantage of those bendy busses (boo!). This can wreck havoc with connections. I once arrived in Frankfurt from Sofia with only 35 minutes to clear customs and board my flight to Paris. I knew I was hosed until the pilot came on the PA and announced that the crew wasn’t staying around to say goodbye because they had to get to their Paris flight! So I made it anyway and got to fly with the same crew a second time, lol. I prefer airstairs as well. Preferably those attached to a Gulfstream G650. Is passenger boarding *always* from the left/port side? And if so do you know he origin of this (why and how long)? Always on the left since this was how one got onto a horse. Just kidding. Passengers and crew boarded (and still board) the Ford Trimotor on the right side. In the rear. Boarding is typically accomplished through the left side because most of the servicing is accomplished on the right side: fueling, cargo, catering, lavs, etc. all happen on the left side. While not impossible to flip flop these systems between aircraft, it’s certainly easier to have it all on the same side every flight. I was picking up my brother from IND-AUS and he got a chance to de-board via airstair since Allegiant uses the south terminal. It was designed to give a nostalgic, old-school feel to flying (and be cheap; no jetways, less cost! Hence Allegiant uses it). Certainly makes you realize you’re boarding a plane and not just “entering one interior into another” -Patrick Smith. I didn’t really appreciate how big the 747 is until I had to use a drive-up airstairs to exit one in Stockholm years ago. Another reason boarding takes so long is people bring way too much stuff onto the aircraft. Instead of bringing what they *need* during the flight onto the cabin, they bring as much of their luggage as they possibly can. Why? Because checked bags take forever to reach the carousel and more importantly because checked bags cost lots of money. The airlines have only themselves to blame for this mess. If they charged for carry-ons rather than checked bags (and if they strictly enforced their own carry-on rules) people would carry less onto the cabin, boarding would be faster, and there would be a much more relaxed atmosphere during boarding and deboarding, in fact during the entire flight. As one who is fully guilty of often too much carryon, I apologize. I take my CPAP machine because even one night without it could be deadly. I take my medications, because they are hard to replace and essential. I take a change of clothes and a night shirt, so, if my luggage takes its time finding me, I can survive. I take my Kindle, laptop, and phone because I worry about checking them and I don’t go anywhere without my Kindle these days (it is far more important than a phone). I take a coat and a walking stick, the former for weather (and it holds stuff) and the latter so I don’t fall over. All of that is two bags, a coat, and stick (which causes more troubles than you’d think it would). I check my suit bag, additional canes, and my large suit case. People are slow boarding planes because they are, slow, lazy, disorganised and oblivious to other pax around them. See enough go of it in Shopping Malls. I won’t lie, I fly a lot and I have often thought that if I am ever injured in an aviation-related accident it will be a jet bridge collapse. I am polar opposite in that I hate stairs and love jet bridges. Stairs are not disabled friendly, and are absolutely deafening being completely out in the open. 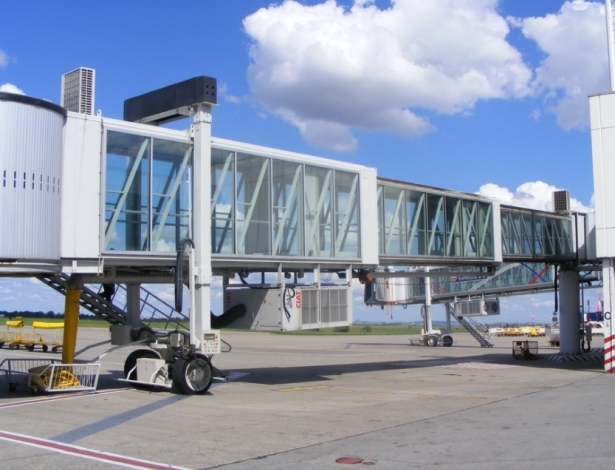 Jet bridges are much quieter being connected to an enclosed airport gate and are far better with disability access. Disability issues are my concern with the stairs, as well. This isn’t to say that jetways can’t be improved on, but at least they’re not guaranteed to run afoul of the ADA. I fly with my 90+ year old father and am truly grateful for the jet bridges. Lufthansa personnel in both Frankfurt and Munich had to carry him up and down stairs when there was no jet bridge or available lift truck–we were both very nervous. Extremely difficult to make one’s connections if you have to wait because you can’t do the stairs. If you’re able-bodied, sure. On the other note, this trend in the US of ever-smaller and slower jets domestically is upsetting for a fearful flyer like me. Not only do they bounce more with the more frequent turbulence, but those of us with claustrophobic issues are more nervous in tiny tubes vs. wide-bodies. And, the flight times have increased by 30-40 minutes for most legs (in the air). It’s okay for a short hop of 30-90 minutes, but can airlines please go back to bigger planes for those 6 hour trips from coast to coast? I know. This is just me being romantic. The benefits of the jet bridge are obvious — inclement weather, disabled passengers, etc. — and I realize there’s no going back. Everyone talking about the glories of the jet stairs cannot be a frequent traveller who travels in all seasons. Frankfurt in winter snow or worse, drenching rain is not a fond experience. I’ve boarded CRJs in Charlotte through the built in stairs in all kinds of weather. Traveling is an adventure and I look at being exposed to the elements as part of the adventure. And you know what Frodo and Bilbo found out about adventures, right?